The father of Barcelona FC starJorge Messi is implicated in a massive drug money laundering scam, using the foundation his son setup to help disadvantaged kids, according to El Mundo. You’ll remember that Messi was arrested earlier in the year accused of tax evasion. It seems that the thing is even larger than him fiddling his taxes – his Pa seems to have been hanging out with the wrong sort. The issue is under judicial secrecy, but Messi Sr and several other high profile names at Barcelona FC have been interviewed by the fiscal crimes unit of the Guardia Civil relating to this matter. No arrests have been made yet. Footballer son has not, it seems, been directly implicated. No, replies the young lad, “I’d rather be Messi”. 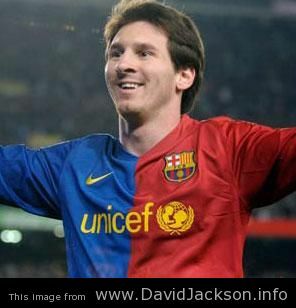 This entry was posted in Blog and tagged drug money, fc barcelona, lional, messi by David. Bookmark the permalink.